How about a tasty vegetarian dish for two? 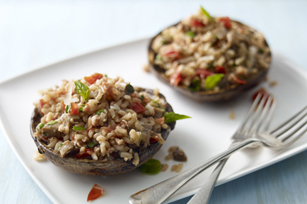 We’re talking portobello mushrooms stuffed with rice, tomatoes, cheese and basil - all grilled to perfection. Use spoon to remove stems and brown gills from undersides of mushroom caps. Discard gills; chop stems. Brush both sides of mushroom caps evenly with 2 Tbsp. dressing. Heat remaining dressing in small skillet on medium heat. Add chopped stems; cook and stir 6 min. or until tender. Stir in rice, tomatoes, cheese and basil. Grill mushrooms, top sides up, 5 min. ; turn. Top with rice mixture; grill 5 min. or until mushrooms are tender and cheese is melted. Prepare using Cracker Barrel Shredded Part Skim Mozzarella Cheese. This satisfying meatless dish is a great way to use leftover cooked rice. These delicious savoury stuffed mushrooms can be part of a healthy eating plan.